I was expecting a bump, but this was a bigger change than expected. Tomorrow morning I will be doing a 40% water change, and the "waste" aquarium water will go into the barrel system to help push it along the cycling process. I am also going to find some way to plumb some ammo-lock into the aquarium's water flow. With the feeder off, Tank temp at 70, and the drop in pH, they should be okay. A fish, Big-or-little-or-feeder-goldfish as-yet-undecided, will make the trip to the barrels tomorrow. This is as much to verify the water quality (did I get those barrels "really" clean?) as it is to reduce the crowding. Also I came up with a neat little idea for self cleaning screen filters. It has some difficult compound curves and would be a nightmare to try and fabricate, so it is going to stay in the notebook for now. he fish looked happy this morning, and enjoyed a small Breakfast, though a couple of them looked at me as if to say.. "That's it? You are kidding, right?" Sorry Fishies, I can't have a big ammonia spike killing you off. I didn't remember to dump and refill the barrel I'm leaching the nasties out of. Tonight I'm going to put together an aerator "tower" for the barrel system if I can find a pvc bit that is the right size to screw into the fitting on the barrel. The idea is that Water will pump in at the top and splash down through a series of baffles tor maximum air exchange. Physically I think it's going to look like one of the "strawberry trees" folks make out of PVC, but upside down to keep the water splashing +inside+ the tube. All of that is contingent on me not thinking up something else that will require less pump head. Does anyone else have other ideas for aeration? I've also thought about setting up a _small_ paddlewheel instead, but that would mean adding another motor and using more electricity in a wet environment.. I should mention that I'm using my fish barrel(s) vertically | instead of horizontally _ like in the barrelponics book. The idea de jour is Tank -> FBF -> Aeration -> Tank, with the growbeds optionally inserted in the system between the Tank and FBF. That will allow me to move the fish bits into the garage and keep fish over winter. Explaining the Bulkhead fittings in the garage wall may be "interesting" if we ever sell the house. I got my fish today, and ran into an uh-oh. I was planning on keeping 20 finger-sized tilapia in my (well cycled) 50 gallon indoor aquarium while building for the barrelponics-mutant-system to cycle. My 50 gallon tank is very very very crowded. Tonight I am going to work on chopping up some barrels and putting together a filter for the barrelponics system to transfer the big fish into it. I found a (semi-) local company with Tilapia! And they are delivering locally tomorrow! I ordered 20 fingerlings. I also installed a 23" bubble wall on the back of the aquarium for additional aeration. It will need it going from 2 fish to 22. Last night I found the Barrel Fairy! 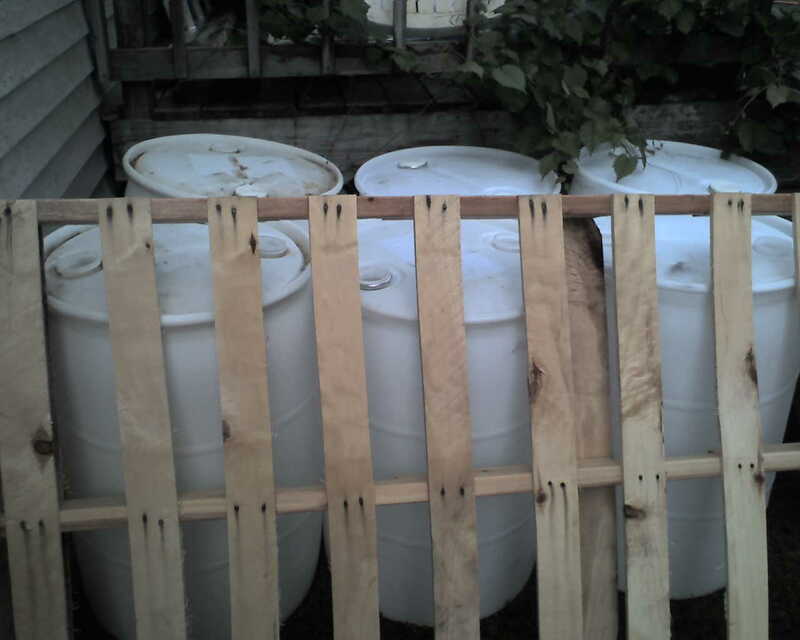 I now have 6 slightly used 55 gallon Barrels. I linked to the Barrelponics manual on my bookmarks list. -> That is what I'm going to do with these. I think I have enough for two complete Barrelponics systems, but I'll start with one and see how it works. As luck would have it, I also found a Pallet that is the perfect size to hold the growbeds! Thank you Mr. dumpster! Yesterday I worked a little on the AP system with the kids. We installed the new drain fitting, and it doesn't look like it is going to leak. (Yeah!) I tried to heat and bend some PVC to make a larger autosiphon, but it just burnt instead of melting. oops. Here goes ANOTHER trip to the Lowes. Thank heavens PVC is cheap. In other news, there was an add for plastic barrels on Craigslist for $5 each and a seperate ad for a free 29 gallon fishtank. I called and left a message for both. The Little tank would be great for fry and the barrels could be used for a barrelponic system. I did some more research on the UVI system last night. The whole setup occupies less than an acre with room to grow. (Yes, that's right.. I double checked.) There is still some homework to do, but feel pretty solid on the fundamentals of the business plan now. Brenden, Bella, and Ashley helped me test the pump and fill up the tanks. Kids take to playing with water better than fish do.. ;) Anyway I tucked the fish tank, a 50 gallon Rubbermaid tote, underneath the deck, and plumbed a drain into the 10 gallon tote full of gravel. I clicked the pump on and... Viola! it worked, the growbed filled with water. Yeah! My growbed uses a "loop siphon" This allows the pump to fill the bed slowly and then very quickly drain the water back into the fish tank. This "flood and drain" cycle alternates between feeding the plants and giving them the air the roots need to survive. My autosiphon worked perfectly... once. After that it just trickled. Ooops. A couple of things went wrong. First, the siphon was too small. (Okay, I will admit it.. Size matters.) I cheaped out and tried to use the pump piping as the siphon. That did not work because the pump is faster than the drain. Second, the siphon pulled rocks into the inlet, slowing it down even more. Also, the 50 Gallon tote I'm using for a growbed is severely bowed out from the weight of the water. I will need to reinforce it if there is any hope of getting the lid back on. I could put something together out of 2x4s, or partially bury it. Time will tell. Tanks need to be stronger. Siphons need to be bigger. Siphons need a screen to keep the rocks out. Kids like to play in the water. I can see the future.. I see another trip to Lowes tonight. These are the sites I am using to learn about aquaponics. This post will be updated over time. Backyard Aquaponics - An Aquaponics site with an absolutely AWESOME forum. Veggieboy, TCLynx, Jaymie, and many others really know their stuff. UVI Aquaponics "Short Course" - Training and hands-on. ATTRA Aquaponics Resource page - Indirectly funded by the USDA. Tons of information. Shell Grit (Tractor Supply) - Useful for buffering the PH of a system. TilapiaSeed.com - Tilapia hatchery offering Fingerings (baby fish). Aquarium Test Kit - PH, Nitrate, and Nitrite are the important tests. Aquaponics is a compbination of Aquaculture (fish-farming) and Hydroponics (growing plants without soil). Traditional Aquaculture grows fish in an artificial environment with heavy doses of antibiotics and chemicals to maintain a profitable stocking density. Hydroponics uses a frequently changed water and nutrient solution to feed plants. Aquaponics is a synergy of these two technologies, and uses wastes from the fish to feed the plants, while the plants filter the water to return to the fish. Naturally occurring soil bacteria complete the cycle, allowing for healthy fish and plants. 5/5/2008 - Created Blog, basic template, google adsense, first four posts, quicklinks for reference info. Hello, and welcome to the Greene Aquaponics Blog. I am working on building a hobby scale aquaponics system, with an eye toward a full commercial system at some point in the future. This blog will receive updates over time, with more information as my skills and system(s) progress.